At the end of a blind alley, surrounded by wooded hills and meadows, the \"Moulin-de-Vaulx\" will welcome you for a stay with friends or family, or for company trips like seminars or teambuilding activities. 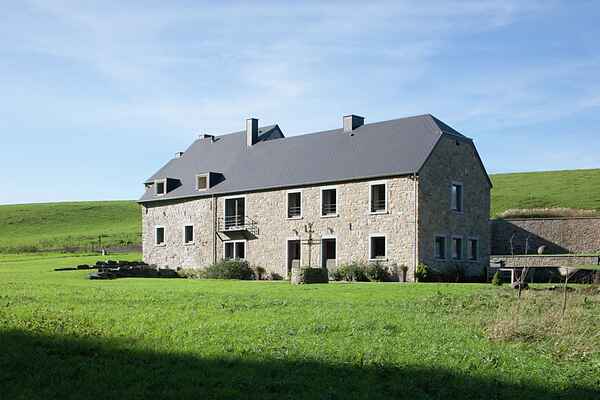 This old farmhouse which has been fully renovated guarantees a remarkable stay. You will find peace, space and comfort in this charmingly decorated apartment with a warm atmosphere. Young and old alike will enjoy the billiard table in the entrance hall and the pizza oven in the kitchen. The holiday home is surrounded by a big garden next to a small river. There are many terraces, so you can enjoy the sun during the whole day. There are also many sport activities and sights in the remarkable environment of Vallée de la Molignée. And for those who love motorcycles and cars, the circuit of Mettet is just a few kilometres away. The Moulin-de-Vaulx consists of 2 entities: a large house and a smaller one. You'll have access to the entire holiday home: you'll be the only residents in the large house as well as the small one.